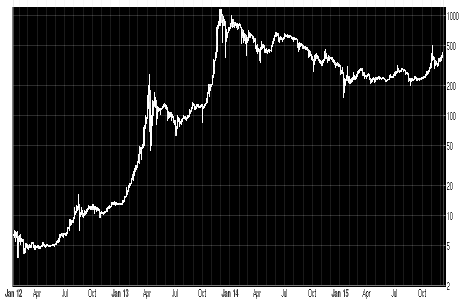 Bitcoin, the miracle from the cyberspace, may see new highs. Let’s have a look at the remarkable chart that shows an advance from $5 to over $1000 in less than two years. Yesterday Bitcoin managed to get over $400 again and this long-term chart looks as if it were ready for more. During the last weeks the price got wild — look at the parabolic peak in November — and now edges again towards new local highs. During the last two years there was no such accelerating upmove and no restart like what happened these weeks. The main possible driver of new all time highs in the future is the ETF that still has to be born and start trading on American stock exchanges. Whether it will arrive or not isn’t clear yet, but once a positive decision becomes more likely, expect heightened interest from speculators to get technically easy into the Bitcoin adventure. Be prepared and start trading Bitcoin directly or with CFDs earlier. It may pay off to already hold Bitcoin before the ETF finally starts trading, because others will be selling the news and/or cashing in during the expected inflow of new cryptocurrency interested capital. In other words, the big move may come ahead of the Bitcoin ETF debut. You could try to catch it with the simple Zen trade and hold BTC for a ride into the birth of the ETF.